FRENCHAY Village Hall was our comforting beacon as we strode across the common on a wet and windy Friday night, inside ablaze with twinkling fairy lights and packed to the gunnels with friendly faces as a warm aromatic mist rose above the throng, consisting mainly of local ales, cider and indulgent chocolate brownies. For anyone who has ever had the chance of seeing O’Hooley & Tidow live (including their previous visits to our locality), they would already know that they were in for one of the best musical experiences on the scene, and if new to this duo’s already classic back catalogue, then it would not have taken more than just a few clicks to discover we had some top notch, critically acclaimed, award-winning musical talent in the house. This turned out to be an evening of journeys and the inspiring stories of ordinary people (with a number of frankly tear-inducing songs about animals). This is what folk music is truly about... us, me and you and the joys and travails of daily life. They visited us not long in to their new tour (after a recent stint as part of folky super group Coven) opening their set and very much setting out their creative stall with a tale of gentrification, The Hum. A story of everyday life in a working community, this was about “the sound of the people”... “a group is a heart is a mind is a voice is the hum”. 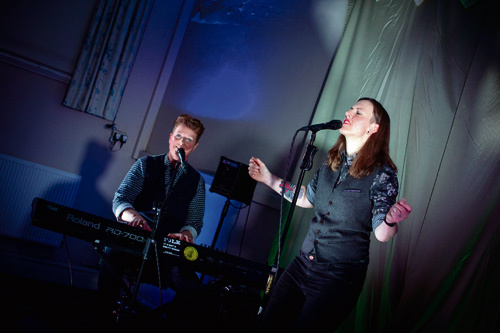 Belinda and Heidi create harmonies that you emotionally float away on and all held together by Belinda’s faultless piano playing, each track delivered as if they were singing just to you in your living room at home. Colne Valley Hearts talked of their community, a place of “smog stained stone” that “makes us know we’re home”; such a timely song about how welcoming our communities can be to new people, all people, with the line “cold hands, warm hearts” summing up a set of values with the power of their lyrics. Blanket left me and my friends in bits, with tears soaking the floor of the hall; this tale of orphaned elephants at the David Sheldrick Wildlife Trust in Nairobi was both a vocal harmonic masterpiece and a catalyst to unabashed blubbing. It’s a good thing that they countered this melancholic mood with a rousing song of drinking beer that included a marvellous kazoo set (I say more kazoos!) with the whole audience joyously joining in with the chorus. There was also a moment of what they described as “Morris Pride”, reaching out to the much maligned morris dancing community in The Pixie. Their song Beryl has received much praise including from the award winning actor Maxine Peake who recently described it as “beautiful and brilliant”, and after hearing this rendition, we all agree with Maxine. Made In England shone a spotlight on our country and its contradictions (“ruby murray, kebab in a hurry”) and challenged head on a rise in bigotry and hate and was met with supportive cheers and whoops from the assembled proletariat. When Belinda played a track from her new solo piano album you could hear a pin drop, inspired by her own Irish heritage, if you weren’t a fan by this stage of the gig you had no soul! One of the highlights of any O’Hooley & Tidow gig is Gentleman Jack and this was no exception. And to top it off, it’s soon to be the soundtrack for the forthcoming Sally Wainwright BBC/HBO drama starring Suranne Jones. Our support act for the evening was Mike Weaver, who beautifully set the scene for our forthcoming delights early on pricking our tear-ducts with a poignant tale of a dying dog (Chasing Squirrels In The Sky). He, like the main act, gave us touching songs of daily life from a daughter leaving for university to memories of his family Summer holidays in West Wales (Pembrokeshire Fair), all finely accompanied by Mike’s skilful guitar playing. What an evening in a little hall near Frenchay common... passion, lyrics and music honed by true artisans at the top of their game, and an evening where you laughed your socks off, cried your eyes out and sang at the top of your voice. You can’t ask for more than that.